A vertical triband of ultramarine (hoist-side and fly-side) and gold with the black trident-head centred on the gold band. The national flag of Barbados was officially adopted on 30 November 1966, the island's first Independence Day, when it was raised for the first time by Lieutenant Hartley Dottin of the Barbados Regiment. It consists of a triband of two bands of ultramarine, which are said to stand for the ocean surrounding the country and the sky, separated by a golden middle band, which represents the sand. A black trident head, commonly called the broken trident, is centred in the golden band, and the fact that the staff is missing is significant. The trident symbol was taken from Barbados' colonial badge, where the trident of Poseidon is shown with Britannia holding it. The broken lower part symbolises a symbolic break from its status as a colony. The three points of the trident represent the three principles of democracy: 1) government of the people, 2) government for the people, and 3) government by the people. The design of the flag was created by Grantley W. Prescod and was chosen from an open competition arranged by the Barbados government. Over a thousand entries were received. The official British Standard colour code numbers for the flag are: Ultramarine —BCC 148, Gold — BS O/002. 1958–62 Flag of the West Indies Federation Known as "Sun and Seas Flag" -- A blue field with four white horizontal wavy bars (the top pair of bars being parallel and the lower pair also parallel) and an orange sun in the centre. 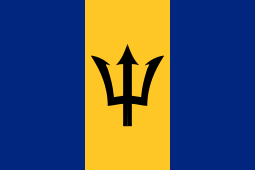 Wikimedia Commons has media related to Flags of Barbados. ^ "Government of Barbados National Flag". Barbados.gov.bb. 12 November 2003. Archived from the original on 28 April 2010. Retrieved 4 July 2010. This page was last edited on 5 January 2019, at 07:14 (UTC).